In the East not much has changed BUFFALO, GEORGIA and TORONTO are clearly the top three. At the moment I would give the BANDITS a slight edge over the other two. Don’t be surprised if either one of these three, comes out on top when all is said and done. MATT VINC has been a huge difference for the BANDITS, he leads NLL in W’s with nine & save %. (.799%). This without question is the biggest off season acquisition in the NLL. Anytime you get a six time goalie of the year with three championships he is going to take your team to the next level. SHAWN EVANS is playing at MVP level. CHASE FRASER and THOMAS HOGGARTH have taken their games to the next level and provide the BANDITS with secondary scoring. JOSH BYRNE figures to return from injury as well. They have the depth to make a deep playoff run. The GEORGIA SWARM are serious contenders once again. They are loaded all over the field and are led by LYLE THOMPSON. I have been impressed by the play of CHAD TUTTON and BRIAN COLE from the defensive end. ZED WILLIAMS is also having a breakout season up front. NEW ENGLAND is in a strong position for the final playoff spot. CALLUM CRAWFORD is having a great season, but his 6 game suspension will have a major effect on the team. IMHO he was a top 3 candidate for MVP thus far. The BLACKWOLVES have a solid lead for the final spot and should be able to hold off ROCHESTER. GLENN CLARK has done a great job coaching this team. I love the defensive style they play and the way DOUG JAMIESON has taken control in goal. Ultimately I think they will fall short, but this is a solid squad. ROCHESTER and PHILLY are looking forward to next season as 2019 appears to be a rebuilding season for both. This was kind of expected. ROCHESTER is in transition as they look forward to their move to HALIFAX. They don’t look terrible, yet they haven’t played so well either. This is a lost season for the franchise, I don’t see them making the playoffs. The WINGS have shown some flashes of good lacrosse, but they seem to find a way to lose most games. The recent acquisition of KEVIN CROWLEY is massive and gives them one of the top forwards in the game moving forward. MATT RAMBO has been a pleasant surprise, he continues to improve his box game. Reminds me a lot of CODY JAMIESON. I’m still trying to figure out why the gave away CHRIS CLOUTIER, from a lacrosse standpoint that trade makes little sense. In the West, SASK looks like they may be vulnerable this season, although they are still in first place at 6-4. Make no mistake the road to the the west will go through SASKATCHEWAN. Although they don’t look invincible this year, they are battled tested and have the talent to win the title. Their offense hasn’t put up the numbers they did last season, but they are fully capable with MATTHEWS leading the way. JEREMY THOMPSON is having a great quiet season. He continues to post solid FO #’s (55%) and leads NLL in LB's with 127. The RUSH have a great home field advantage and I don’t see anyone out west that can beat them in 2019. CALGARY has all the pieces to challenge the RUSH. They are strong in goal with DELBIANCO, DICKSON and DOBBIE lead the offense. RHYS DUCH has been a massive pick up with his scoring and the depth he provides. However, when the two matched up this past week it looks like the ROUGHNECKS have a lot of work to do if they want to overtake the RUSH. SAN DIEGO, VANCOUVER and COLORADO will fight it out for the final two playoff spots in the west. As predicted the SEALS would have a bigger impact than their expansion brother from PHILLY. When you look at SD it starts with AUSTIN STAATS. The first overall pick is a franchise player and he is showing it this season. He will be the Rookie of the year and will be in contention for ALL NLL. KEVIN BUCHANAN has continued his hot play from the summer MSL season. The SEALS have put together a great mix of young and old and it is working as they sit second in the west. DAN DAWSON, GARRET BILLINGS and BRODIE MERRILL mixed with young talent and solid goaltending is a winning formula. I see VANCOUVER edging out COLORADO for the final spot. I like the offensive talent from the WARRIORS. KEEGAN BAL has shown he is a legit player in the league. MITCH JONES is producing after a slow start and LOGAN SCHUSS is always dangerous. Who will be in net is a question. ERIC PENNEY seems to be edging ahead of AARON BOLD. The WARRIORS have also won the uniform game with their icy white threads, it is such a clean look. So at this point we are foreseeing BUFFALO/SASK final, but don’t be surprised if GEORGIA is there. RF: SHAWN EVANS, BUFFALO: 23g, 46a 69 pts, 16.2% shooting. He been there all season for the BANDITS. Always one of the best competitors in all of sports. LYLE THOMPSON, GEORGIA: 30g, 39a, 69 pts. 19% shooting. The best all around player in lacrosse. Looking for his second NLL title this year. CALLUM CRAWFORD, NEW ENGLAND: 34g, 47a, 81pts. 17.3% shooting. Very sad to see him suspended, but it had to be done. LF: DANE DOBBIE, CALGARY. 27g, 38a, 65pts. 15.5% shooting. Continues to pile up the points as he tries to help CALGARY overtake SASK. MARK MATTHEWS, SASK. 22g, 34a, 56 pts. Shooting 19.1%. Not having the season he had last year. Is still one of the top lefty’s. TRAN: KIEL MATISZ, PHILADELPHIA. Having a breakout season for PHILLY as he plays both ends of the floor. Sits 17th in the league with 48 points (16g, 32a) and 9th with 78 LB's. ZACH CURRIER, CALGARY. 2g, 11a, 112 LB's. The Swiss Army Knife of lacrosse continues to shine. DEF: STEVE PRIOLO, BUFFALO. Having a career year with 9g, 10a and 86 LB's. Such a physical presence who is dominating. GRAEME HOSSACK, ROCHESTER. The KNIGHTHAWKS not having a great season, but he is still one of the best in the game. KYLE RUBISCH, SASK, 1g, 5a, 78 LB's. Classic defensive defenseman, has been the rock of the RUSH defense this season. GOALIE: MATT VINC, BUFFALO. Best in the business! 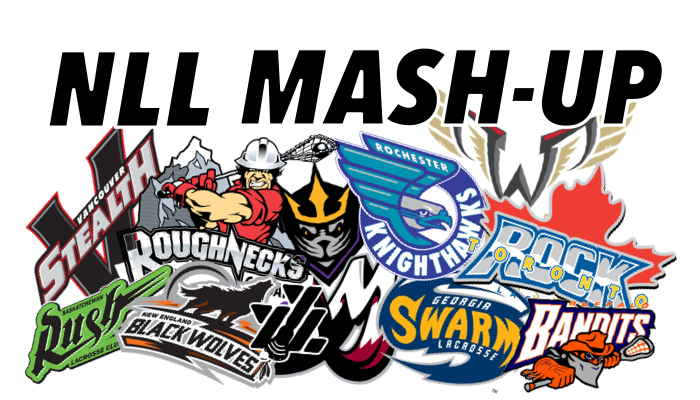 ARTICLE: "The NLL Unstrung: Injuries, Ice, & Transitioning to Box" [nll.com] ... "kill the guy with the ball" ... Great insight! VIDEO: "MARYLAND vs NOTRE DAME Lacrosse Highlights" [youtube: LaxFactor] ... BRIAN WILLETS for the win!